Travelers visiting Sofitel Legend Metropole Hanoi are invited to enjoy a world of notability. From its advent in 1901, this historic Vietnam hotel has proved to be an outpost for the most dignified guests, including actors, songwriters, socialites, and more. It has remained steadfast, standing through wars, renovations, and ownership changes, emerging resilient as one of Hanoi's top hotels. With 364 stunning guestrooms and luxury suites, the elegance of this historic hotel engulfs travelers during their stay as they indulge in comfortable settings and well-appointed furnishings. With three distinct restaurants and three vibrant bars onsite, guests can discern between coveted Italian, French, and authentic Vietnamese cuisine offerings during their stay, alongside vibrant cocktails and innovative small plate dishes. A spa, swimming pool, and salon allows visitors to experience ultimate relaxation, with a fitness center afforded for the maintenance of exercise routines. 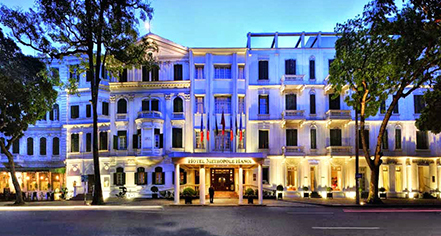 Boasting a location within the quaint French Quarter neighborhood of Hanoi, the city's most treasured sights are just a short distance from the hotel's doors. 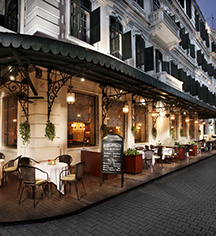 Sofitel Legend Metropole Hanoi, a member of Historic Hotels Worldwide since 2015, dates back to 1901. Charlie Chaplin was a frequent visitor of the hotel, and even celebrated his honeymoon there in 1936 after a Shanghai wedding celebration. Adjoining Rooms: Adjoining rooms available. Please notify request at time of booking. Rollaways: Available upon request; USD 75 per day. Shuttle Service: Train station transfer is available, rates apply. Please contact property in advance for arrangements. Transportation: Limo and town car service is available. Travelers visiting Sofitel Legend Metropole Hanoi are invited to enjoy a world of notability. From its advent in 1901, this historic Vietnam hotel has proved to be an outpost for the most dignified guests, including actors, songwriters, socialites, and more. Learn more about the History of Sofitel Legend Metropole Hanoi .